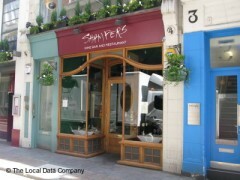 About: Shampers is a winebar and restaurant with satellite TV that serves a variety of British dishes which include daily specials and dishes for vegetarians. Catering for private parties of up to 50 people is available upon request. The decor at Shampers has barely changed since it opened in 1977. All the classic bubblies are available here, including Perrier-Jouet, Dom Perignon and Larmandier. Pair the fizz with oysters and fish, or something else from their mostly British menu. Shampers is NEVER quiet which says alot about the place. The food is mainly fish based but is delicious. They have an extensive wine menu and are very knowledgeable. The atmosphere is always buzzy whatever the time of day. Try to get a table on the ground floor rather than downstairs. They never hurry you up for a table and even though you can sit at the bar, it is always advisable to book in advance. Thoroughly recommneded in my opinion.